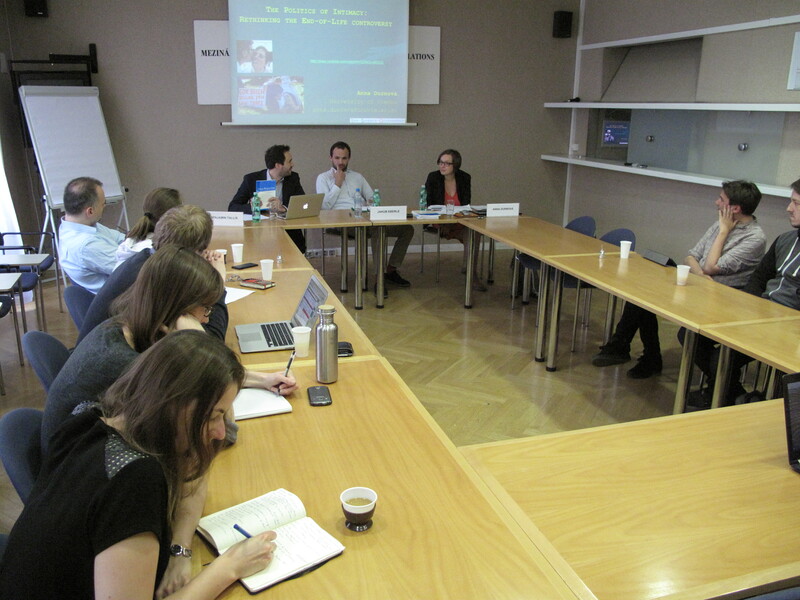 The seminar by Dr. Anna Durnová took place at the Institute of International Relations in cooperation with the journal New Perspectives on Wednesday, May 25, 2016. The lecture, named The Politics of Intimacy: Exploring the Intersections of Policies and Emotions, was based on Dr. Durnová’s research and her forthcoming book The Politics of Intimacy: Rethinking the End-of-Life Controversy, where she explores the encounters between emotions and formation of particular policies. The discussion afterwards was co-managed by Jakub Eberle and Dr. Benjamin Tallis, both of the Institute of International Relations. In her lecture, Dr. Durnová touched upon the most internal emotion, death, and euthanasia and highlighted their interference with different government policies in several European countries. Her approach sought to explore the issue beyond the traditional cultural and ethical explanations in order to highlight the confrontation between emotions of individual person and the technocratic systems of government. The generation of people living in the post-1968 liberal democracy was raised and educated in atmosphere emphasizing the dignity and individuality of every person. This generation now starts to age and encounters with death. Dr. Durnová showed several cases of people, who in their complicated medical situations wanted to choose death rather than to continue in their painful life, but were not allowed to do so by a government. For the government the case was easy: euthanasia is not allowed by the law, meaning the request of the person (and his or her emotions) is not relevant, thus the request needs to be denied. The technocratic system is not able or willing to deal with situations, which involve emotional claims. Still there are countries allowing euthanasia. This does not only lead people to use these systems instead of the one of their home country, but at the same time it allows a transnational traveling of meaning and emotions regarding the experience with the end of life controversies. However, the states, where the euthanasia is allowed, are not free of their own debates. Who has the right to determine whether you have the right to end your life or not? Is it relatives, doctors, lawyers, religious authorities, or the government? Durnová mentioned a specific example of a person with extreme mental disorder disallowing her to live her own life fully. That person could react to touch and voice, smile a bit and express emotions. So who can decide whether to end this life? Can a life with no prospects be ended although one can still minimally enjoy being in the world? Dr. Durnová shows the complicated position of the state particularly on this example. What should the government do at the intersections of freedom and security or rule of law respectively? How does it solve the conflict between self-government (meaning autonomous individual) and institutional power over society and particular bodies? When do emotions enter the political process and are recognized as valid by the political power and when they are the left out by the system? Whose emotions count and whose do not? Several interesting points were raised in the discussion following the lecture. Among others, the issues related to the theoretical conceptualization of emotions, affects and methods of their research were discussed, as well as more specific questions regarding the role of religion and ideology in the end of life controversies. Vojtěch Jirásek is a student of International Territorial Studies at the Charles University in Prague. Mr. Jirásek was an intern at the Institute of International Relations during Spring 2016.